Successfully Added Xiaomi Mijia SIMI RC Football Robot Toy to your Shopping Cart. Multiple footworks get a lot of professional support from players, your children would understand the football game better. The football robot comes in small size, enables you to play with it anywhere and anytime no longer limited by weather condition or venue. Robot Soccer SIMI is an ingenious combination of tactics and techniques of football, capable of recreate the stage atmosphere typical of a real game. 2 robot of two different colors, orange and blue, can be embellished with stickers present in the package. 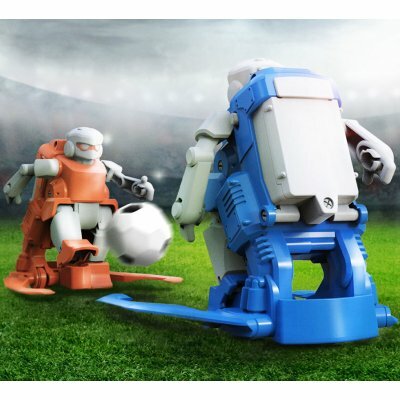 Made of highly resistant ABS material approved according to the RoHS Community legislation, the 2 robot soccer players can be controlled via a 2.4GHz controller and enable to play some typical actions of football players through buttons, like dribbling, football, shooting, etc..